Last year we posted several of our OEM Performance and Purchase Analysis results in the form of info-graphics. The response was amazing, due to the eye opening data we are able to provide buy utilizing our partnership with IHS / Polk. Partnering with IHS / Polk allows us acquire and validate Lead to Close performance. In return, showing lead attribution from lead conception all the way to the sale. Not just a sale at your dealership but a *sale all-together. The first OEM we’re going to analyze this year is KIA. Starting from the top, you see “Leads Generated“. During the months of 6/1/2013 – 5/31/2014 HookLogic generated and incentivized 22,338 leads for our Kia dealerships. 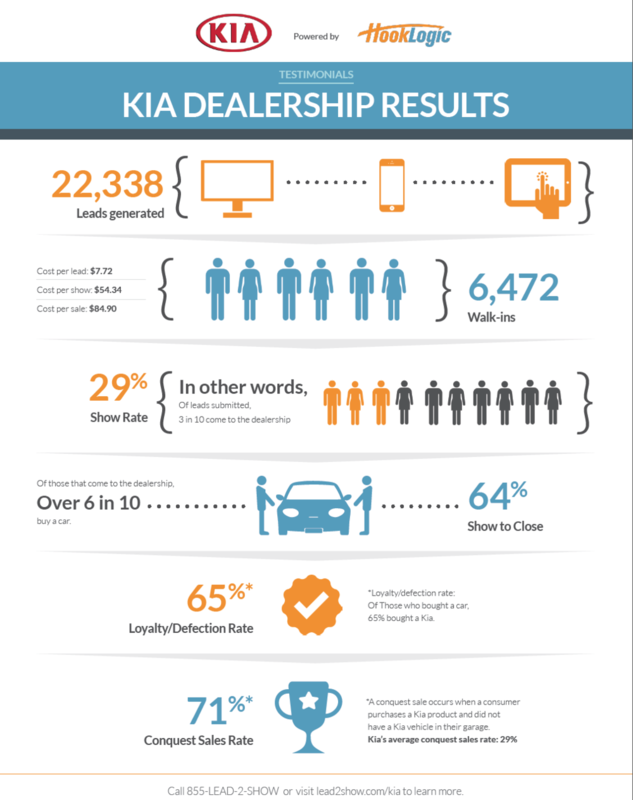 Of the 22,338incentivized vehicle leads, 6,472 of those customers leads walked into a Kia dealership, that utilized HookLogic’s suite of products (during this time frame) to test drive a vehicle after engaging with either Wed2Show or Lead2Show. Of the total amount of leads generated, 3 in 10 showed up at a Kia dealership for a 29% Lead to Show Rate. This is more than twice the national average (17%) Show Rate on internet leads. Of the 6,472 leads that were incentivized and walked into this group of Kia dealers for a test drive, 64% purchased a vehicle. This group of Kia dealers are closing HookLogic incentivized showroom ups at 64% with an overall lead closing ratio of 19%. Most dealers do a good job at measuring their lead closing ratios and closing the customer once they’re in the showroom. What dealers miss out on measuring is their Lead-to-Show rate. This year we've added 2 new sections to the Performance Infographic: Loyalty / Defection and Conquest Sales. For our Kia dealers, the Loyalty / Defection rate is 65%. Meaning, of those customers that sent in a lead for a Kia, bought a Kia. Our Kia dealers also have a STRONG 71% Conquest Sales Rate. *A conquest sale occurs when a consumer purchases a Kia product and did not have a Kia vehicle in their garage. Kia’s average conquest sales rate: 29%. Whether it’s a lead originating from your dealer’s website, 3rd Party Lead, Online Chat lead or HookLogic Web2Show – By getting more in-market shoppers to Show Up at your dealership, you get more opportunities to make a sale. If you're a Kia dealer and looking to increase your website leads, increase your lead-to-show rate and overall sales opportunities, contact us for a full demo!